JotForm's payment integrations allow you to add sales tax to the products you sell, whether tangible or not. IMPORTANT NOTE: Before proceeding, please keep in mind that this feature is NOT AVAILABLE for SUBSCRIPTION and DONATION based payment types. 1. Start by selecting one of the supported payment fields then run the payment wizard by clicking the WAND icon. 2. On the next page after configuring your payment gateway credentials, setup your PRODUCTS and once you're done, go to the TAX tab. 3. Enter a BASE TAX RATE. 4. If there are products you wanted to be excluded from taxes, set them up as EXEMPTED PRODUCTS. 5. You can also set the TAX TEXT ON THE FORM. 6. 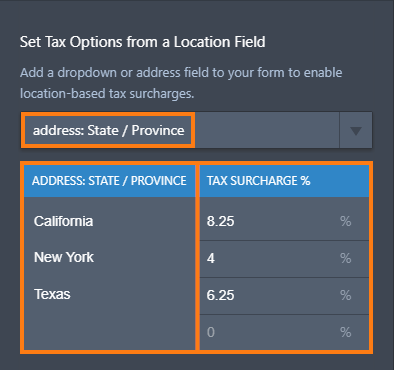 If there's a need for a location-based tax surcharges, tou can set it up on the SET TAX OPTIONS FROM A LOCATION FIELD. Note that this option will be disabled if the form does not have a DROPDOWN or an ADDRESS field where the location can be fetched from. 7. 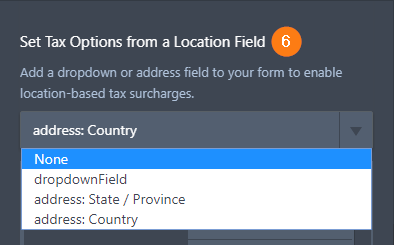 If you select either a DROPDOWN or the ADDRESS: COUNTRY option, you will be asked to enter surcharge rates for the available locations. 8. For the ADDRESS: STATE / PROVINCE option, you must enter a list of states, regions, or provinces with their respective surcharge rates. And that's basically it - Comments and suggestions are welcome below. If you have a question, post it in our Support Forum so we can assist you. What about Braintree? Tax calculation is imperative for every payment method. Tax on Subscriptions - We also need to charge Tax on subscriptions. The tax added feature is NOT AVAILABLE for SUBSCRIPTION and DONATION based payment types. Is it also not available for USER DEFINED AMOUNT? Is there a way I can add tax to USER DEFINED AMOUNT? I really appreciate the step by step help your company provides. Unfortunately this still doesn't seem to be adding tax to our form. I'm in the process of upgrading the account and we would like to release to our Clients tomorrow, but I need to make sure we have tax added for the appropriate purchases otherwise our accountant will be very unhappy with me. I have tax set for both NC and VA. The test purchases were made from NC with the billing addresses the same, so the tax should have linked on just like the shipping, but it didn't. Can you please let me know how we might overcome this issue? Without adding every county in the USA, is there any way for it to add the appropriate tax for the shipping address? what about square? 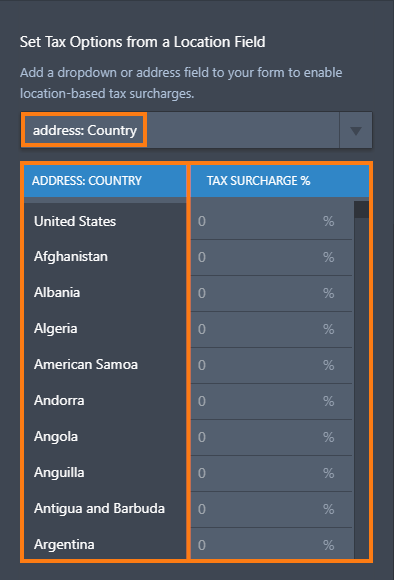 I can add taxes..
Why is this not available for subscriptions? but if we don't wont to do the payment with paypal or the ones you suggest on your site? Not sure why this is not working for me. I need to enter different tax rates for CANADIAN PROVINCES. The tax rate for US States would be zero. How can be be sure to caputure the correct tax for each province? How to add a condition based on the city inputted in the address field?